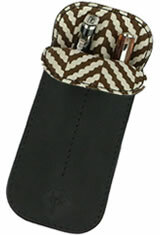 The Dee Charles Designs Double Sleeve pen case is great for carrying 2 of your favorite pens. The case is made of durable leather and finished in colorful stitching. A small stitch in the center of the case protects and prevents each pen from touching. Choose from a great selection of leather and stitching colors combinations. Available in basic midnight black, sunrise, or the rugged rawhide colors. Each Dee Charles Designs product is handcrafted in the US from top quality supplies and made to last. The Dee Charles Designs Double Sleeve Pen Carrying Cases usually ships within 1 business day unless otherwise specified. Each Dee Charles Designs Double Sleeve Pen Carrying Cases we sell is guaranteed to be genuine, authentic and will arrive brand new & unused!